At least my dining room table is, after emptying the contents of this guy onto it yesterday so I could get busy (pun intended) making him a little more interesting. No room in this house for weak personalities. When the hubby came home from work after the initial "So you finally broke down and did it, huh?" remark, he admitted that he liked it better and the dark color gave it some "depth". Talkin' all sweet like that to me....who said romance is dead after 14 years? With everything down, it was also easier to scrape wipe off the disgusting inch of dust on each shelf. I delegated the scrubbing duties to Roger and Brendan as I walked out the door with Sierra for a night of drama skits at the junior high. They definitely got the better end of the bargain. And I hate to dust. Once it was all dry, Mr. Built-In got loaded. Don't judge- we all cope with stress in our own way. even if I still haven't fixed this. Oh my goodness, it looks fabulous! Love the new color, love the way you have everything arranged. Love it all! Just beautiful! Paint is the best!!!! Looks sooooooooooooo much better! Enjoy it! 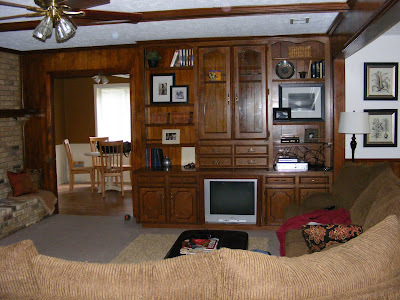 Is that the same furniture as the one in your before picture??? It is sooooo gorgeous! It should be on the cover of a magazine. I absolutely love the red. Way to go! LOVE it! It looks FAB! Wow-what a difference! The red really sets off that pretty clock and makes the baskets look nicer. Wow! The built-in looks SO much better white. And I love the accent of red. It's not overpowering but gives the piece a little kick. Good job! I love it!! PLEASE, keep blogging all your projects... I love them! Ok, don't be hatin' but I totally LOVE the wood look. We managed apartments when the kids were really little. The buildings were built in the 1920s with gorgeous woodwork and in some trend somewhere around the 60s everyone painted over it. HOWEVER, I would give anything to be able to work all that style out in my head first like you do. It looks terrific. Wow! I love that. I agree with your hubby, it adds depth. Hope you don't mind if I mentioned you and linked to your blog in my last blog post. I had to post about being inspired to do some 'painting', using the term very loosely. It doesn't even look like the same book shelf. You're amazing. That looks fabulous!!!! I am a BIG fan of Red, one of my favorite colors... I dont use it too often, but I LOVE IT! I finally found a color for my table... its not black, BUT its Behr... and its called "sweet Molasses" and its a paint and primer in one... SWEET HUH... no pun intended.. LOL.. I am going to home and figure out where to start... and start buying my crap I need! Super excited..
Definitely light years better! I love the changes that you made to the wall unit. What a difference paint and good hardware makes huh? I could take hours rearranging shelves. There are so many possibilities. Usually every time I dust the house (which isn't too often these days) that is when I start shifting around my accessories. Thanks for sharing this! Wow. Double wow. Triple wow. I had to keep scrolling up and down, I didn't believe the "before" and "after" was the same room! All hail the transforming power of paint! Yes, LIGHTYEARS better! The "before" pic reminds me of my kitchen cabinets before I painted them white a few weeks ago. I love your vignettes. You have quite the knack for arranging your collections. Great job! What a change from the orignal. I love the red and I really like how you accesorized. What an AWESOME before and after! Love it!! Seriously Fabulous! What a makeover! Love Love, LOVE IT! What an incredible improvement. What a dramatic improvement! Well-worth the effort, I say! I am so loving that shade of red. Beautiful! Wow! Yep - that is a HUGE difference. The room looks great. And the doors don't look like they need to be "fixed" although - I think there are endless possibilities once you get ready to do it! That looks Fabulous!!! Love the colors!! you are very talented girl!!! Wow! Paint is definitely a miracle worker. New to your blog... your handiwork is fabulous! Don't ya just love paint and its miracle working powers?